"Another recipe with habanero, Minerva? GEEZ!" Well sorry for having excess on hand. I say next time, you blame Duc...and then you hassle me for not making you a jar of pepper jelly to gift (I sure would burn through a lot of the peppers if I constantly canned jelly). This recipe involves getting the pepper involved in a subtle way that is just enough to give your tacos a KICK. One thing I love about Mexican food (totally not claiming I'm making any authentic Mexican food here though...) is the amount of color and freshness! Prepwork for the ingredients just involves a lot of chopping and slicing. 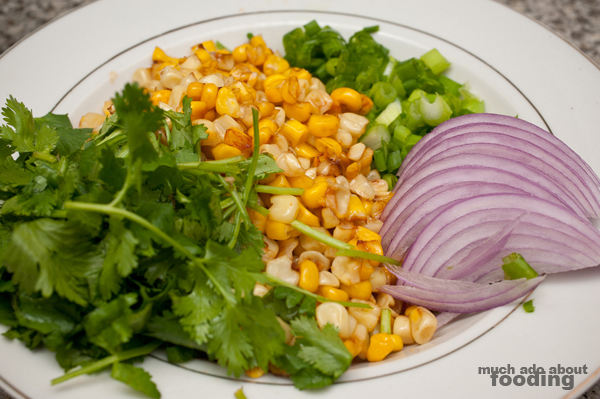 Pick and wash your cilantro, chop up the green onion, and very thinly slice the red onion. Making sure to be careful while handling the habanero pepper (but use gloves just in case! ), slice off the top. 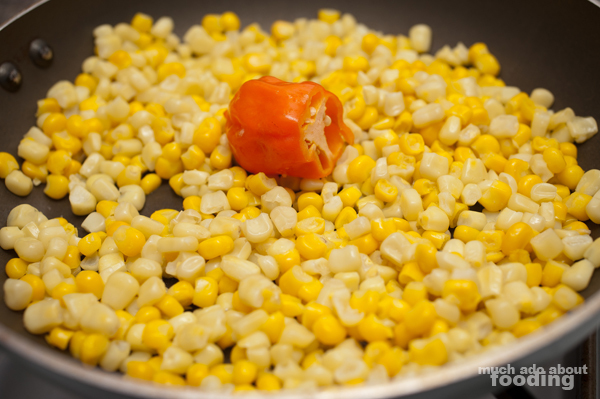 For roasting the kernel corn, add half the butter to a skillet and cook with the open-topped pepper until corn is slightly browned. Slice up your meat. If you've reserved any red onion, you can chop and add it to your meat if so desired. 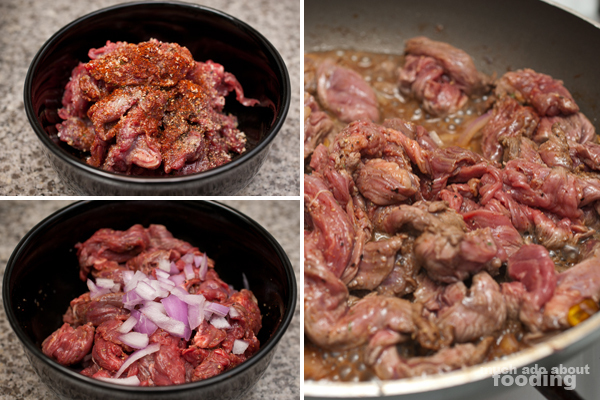 Combine the paprika, chili powder, garlic salt, and freshly ground black pepper in a bowl with the flap meat. Squeeze lime juice into bowl and mix thoroughly. After you've removed the corn from the skillet (but not the pepper), add the remaining butter and cook your meat. Press down firmly on the pepper every once in a while to excrete the pepper oils into the cooking meat. The beauty of making your own tacos is arrangement. 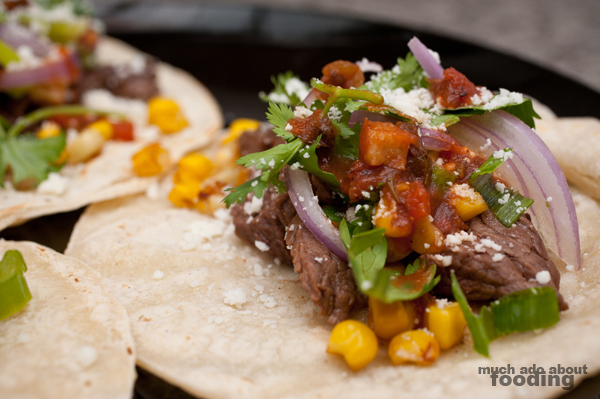 While the meat is in its last legs of being cooked throughout, make sure to heat up your tortillas. I used a smaller skillet just to "toast" both sides of my tortillas. 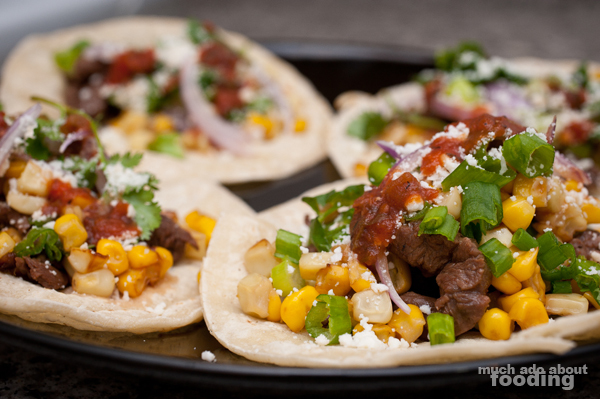 I wanted to layer the meat and corn as my main stars of the taco and place the rest of the ingredients appropriately with a heavy dosage of queso cotija on top. To add more color, Duc suggested some salsa on top but it's not necessary. 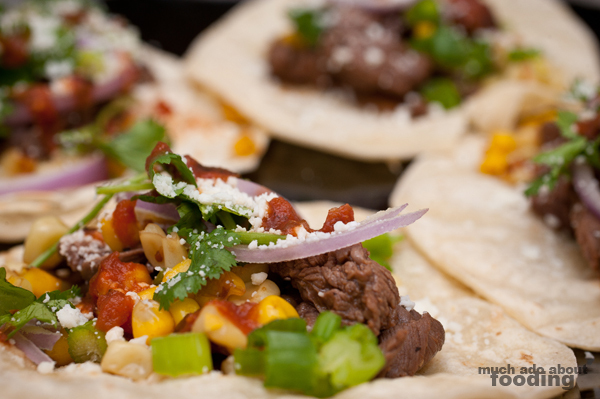 Enjoy the kick of habanero in the meat and corn! Photography by Minerva Thai and Duc Duong.